This tiered fountain is self-contained - the pump and plumbing are integrated into the unit and no reservoir is required. Angelo's Lawn-Scape of Louisiana in Baton Rouge, LA. Self-contained fountains are great because of their affordability and convenience. Fountain manufacturers and retailers refer to fountains that have all the working parts, including the pump and plumbing, enclosed in the unit as self-contained. Sometimes, self-contained is also used to refer to a fountain that has its own water reservoir, it does not need to be placed in a pond or pool. This all-in-one design makes installation easy, saving you labor costs. It also makes it easy to move the fountain to a new location. Self-contained fountains are well-suited for existing patios and decks because they do not require extensive construction. 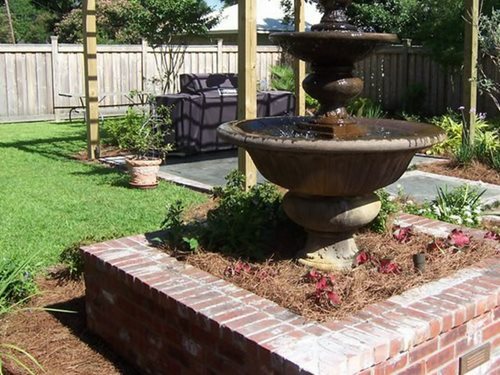 A self-contained fountain can be up and running in a matter of minutes. First, your landscape contractor will make sure that the fountain site is level and stable. If the fountain is going on a patio or deck this will be simple, but if it is going out in the garden, the ground may require leveling and compacting. Then they will place the fountain and add water. Finally, the power source is connected, which may be a standard electrical cord, batteries, or a solar panel, and you're in business. 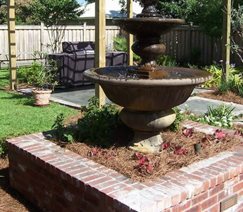 Since self-contained fountains do not have any external piping or need to be connected to a water source, plumbing skills are typically not required for installation. However, if you plan to place the fountain more than a few feet away from an electrical outlet, your contractor will need to run electrical wiring and install an outlet approved for outdoor use. Ask your contractor or designer for creative ideas for hiding the fountain's cord - a well-placed plant or a cord cover can do wonders.